Pinecam.com • View topic - Open Sundays through 3/31 - FREE History Exhibit! Post subject: Open Sundays through 3/31 - FREE History Exhibit! 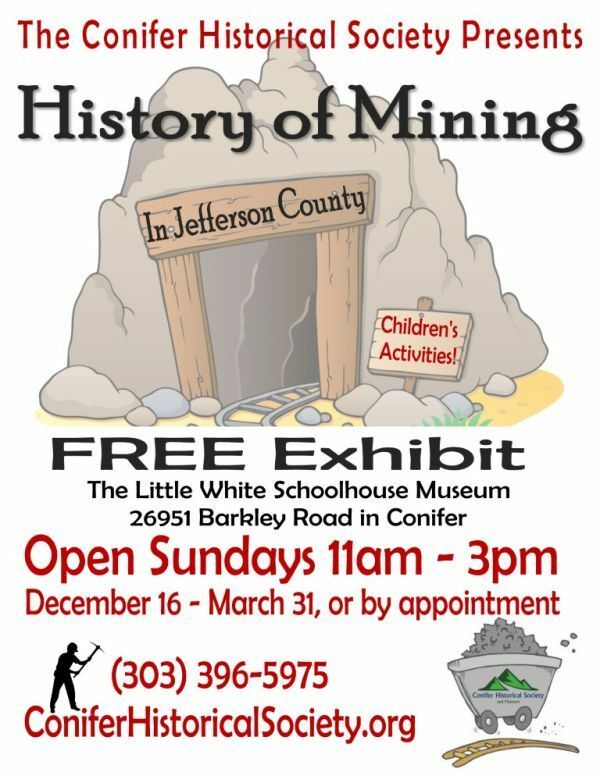 The History of Mining in Jefferson County - our FREE Winter Exhibit at the Conifer Historical Society and Museum! Open Sundays 11am - 3pm through March 31st, or by appointment. With accompanying educational programs each month, this exhibit will share the stories, trials, and tragedies of mining life. Though gold may have brought many miners to our county, it's not why they stayed. Discover how coal, clay, uranium, and more changed the face of our county. Children's activities also available! This exhibit made possible through a grant from Community First Foundation. **Please note we will have shortened exhibit hours on certain days (1/13, 2/10, 3/10) due to our education programs which start at 1pm. Looking for last minute gifts? We have a wonderful selection of hand turned bowls and vases, necklaces, note cards, books, "Santa Gourds" (make great hostess gifts! ), Hand knit baby hats. All hand crafted items were made right here in Conifer and donated to the Historical Society so that 100% of proceeds can support our mission! What a great chance to give a gift that gives twice! Come and browse our holiday gift shop and check out our FREE Exhibit on the History of Mining in Jefferson County! Open Today 12/23 from 11am - 3pm! Learn about the White Ash Mine Disaster, how the 1859 Gold Rush impacted our area, fun facts about the Colorado School of Mines, and more! We do have a children's area as well with some fun activities, so bring the whole family! Post subject: Re: Open Sundays through 3/31 - FREE History Exhibit! Have you ever heard of the White Ash Mine Disaster? Learn about this and more today at our FREE Winter Exhibit on the History of Mining in Jefferson County! Visit the Conifer Historical Society & Museum's FREE Winter Exhibit - open TODAY 12/30 from 11a-3p! Children's activities are also available! 26951 Barkley Road in Conifer. This exhibit shares the stories, trials, and tragedies of mining life. Though gold may have brought many miners to our county, it's not why they stayed. Discover how coal, clay, uranium, and more changed the face of our county. We History, do you? 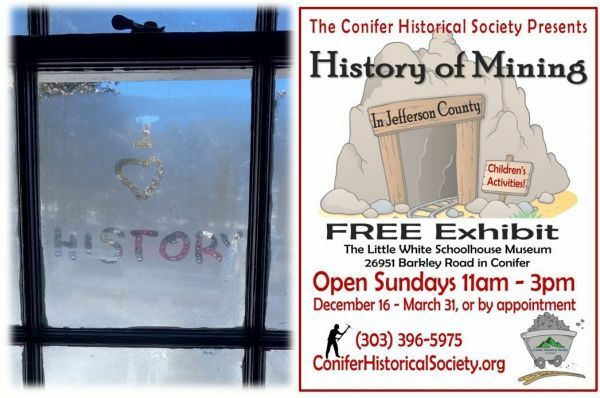 The Conifer Historical Society & Museum's FREE Winter Exhibit is open TODAY 1/20 from 11a-3p! Come check out the History of Mining in Jefferson County - Children's activities are also available! 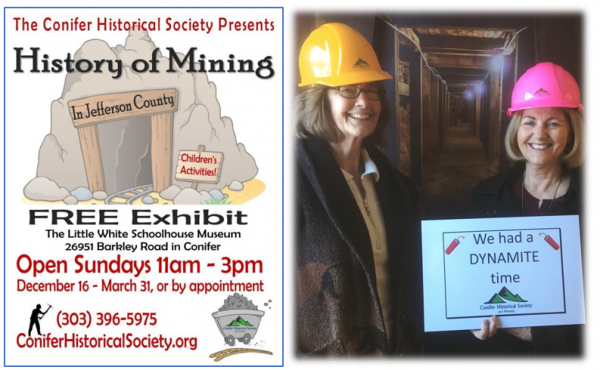 This exhibit shares the stories, trials, and tragedies of mining life in our county. Discover how coal, clay, uranium, and more changed the face of our county. Learn about the White Ash Mine Disaster, how the School of Mines was created, and more! The Conifer Historical Society & Museum's FREE Winter Exhibit is open TODAY 1/27 from 11a-3p, at the Little White Schoolhouse Museum, 26951 Barkley Road in Conifer. Come check out the History of Mining in Jefferson County - Children's activities are also available, and our section on Uranium mining in our area is getting "glowing" reviews! This exhibit shares the stories, trials, and tragedies of mining life. Though gold may have brought many miners to our county, it's not why they stayed. Discover how coal, clay, uranium, and more changed the face of our county. Learn about the White Ash Mine Disaster, and more. We History, do you? The Conifer Historical Society & Museum's FREE Winter Exhibit is open TODAY 2/3 from 11a-3p! Come check out the History of Mining in Jefferson County - Children's activities are also available! 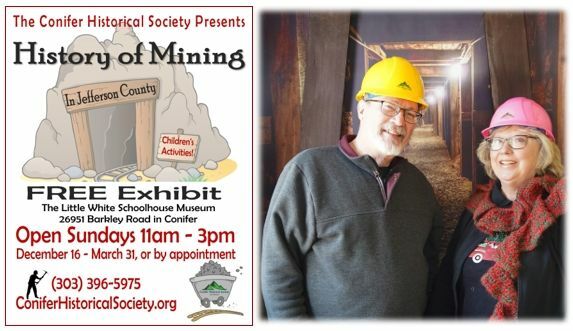 This exhibit shares the stories, trials, and tragedies of mining life in our county. Discover how coal, clay, uranium, and more changed the face of our county. Learn about the White Ash Mine Disaster, how the School of Mines was created, and more! The FREE Winter Exhibit at Conifer Historical Society & Museum is open TODAY 2/24 from 11a-3p! Come check out the History of Mining in Jefferson County - Children's activities are also available, and our section on Uranium mining in our area is getting "glowing" reviews! 26951 Barkley Road in Conifer! Cabin Fever after that big snow storm? We'd love for you to stop by the Conifer Historical Society & Museum's FREE Exhibit - open TODAY 3/17 from 11a-3p! Come check out the History of Mining in Jefferson County - Children's activities are also available! P.S. : Happy St Patrick's Day! 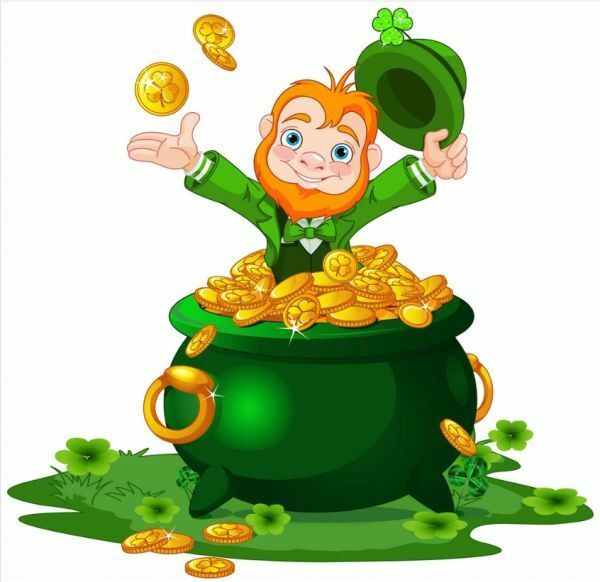 Extra credit for those who wear green today! You just might find a pot of gold at the Exhibit! Lots of People came to Jefferson County in search of GOLD -- so you can, too! The Conifer Historical Society & Museum's FREE Exhibit is open TODAY 3/24 from 11a-3p! 26951 Barkley Road in Conifer. 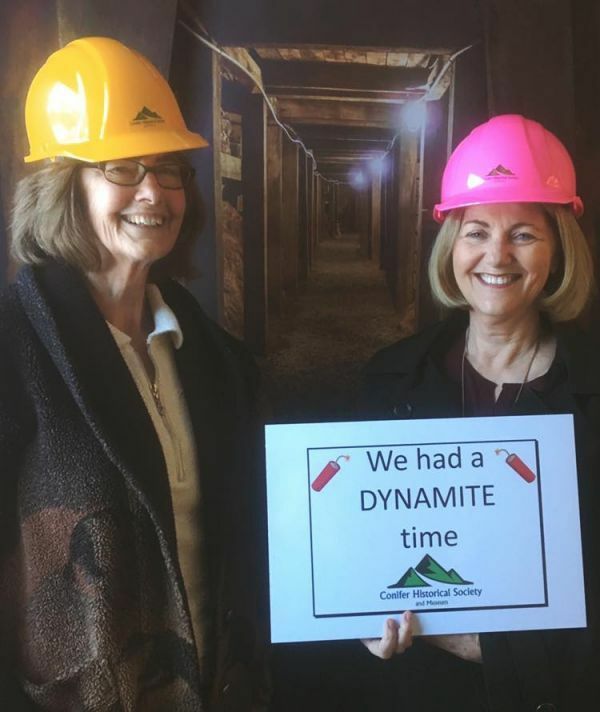 Come check out the History of Mining in Jefferson County - Children's activities are also available, and our section on Uranium mining in our area is getting "glowing" reviews! Boo-hoo! Today 3/31 is the final day of our FREE Exhibit. Open TODAY from 11a-3p! Come check out the History of Mining in Jefferson County - Children's activities are also available, and our section on Uranium mining in our area is getting "glowing" reviews! Quick, don't miss your last chance to check it out!! 26951 Barkley Road in Conifer.